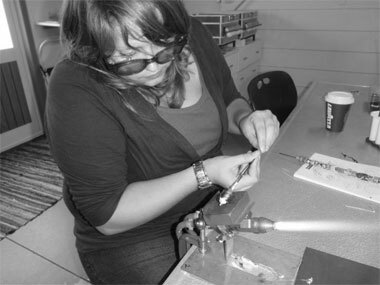 I trade under the name of Red Flower Glass and specialise in hot blown glass and flamework. For me, I love the fluidity of glass and that there are many possible ways to work with it and to cold finish it (cut and polish), giving the solid end result its own specific quality. Glass is always a challenge; there are so many possible things that can go wrong. There is always something new to learn, new techniques to try or even sometimes when you think you have made a mistake, you discover a new way of looking at glass and how to work it; it just makes life more interesting. Travelling has helped to broaden my horizons and skills. Most of my influences for my Blown work come from nature and the organic form, encompassing all the wonderful places that I have visited and the amazing natural world that I have seen. With my Flamework I keep it quirky and fun reflecting the fascinating life I have seen and my own individual character.